Quite simply the best blank DVD+R DL available for use with your DVD copier. Using the combination of the expertise employed in manufacturing the Acu-Disc � CDRs, DVD-R and Blu-Ray Discs, these DVD+R DLs are made with the same optical grade polycarbonate on high quality Japanese moulds. Finished in the same advanced, tried and tested thermal printable coating as the Acu-Disc � White Thermal CDRs, these full surface white thermal dual layer discs produce fantastic results every time. Double Layer Discs provide a massive 8.5GB (2.6 for 8cm products) storage capacity. The double layer of recording has been made possible by the creation of a new substrate layer that sits in between each recording layer, that allows the laser beam to record on both layers. Once the first layer has been recorded, the laser re-focused to record on the second layer. Double Layer DVD+R media expands the storage capacity of the disc to a massive 8.5GB, allowing up to 4 hours of uninterrupted video at DVD quality. 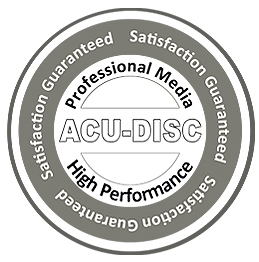 ACU-DISC � are so confident in the quality of their blank optical media they produce, that they are the very first manufacturer of optical discs to offer a Satisfaction Guarantee. Whether you use a CD/DVD & Blu-Ray copier, printer or publisher, ACU-DISC � have the perfect disc for you.